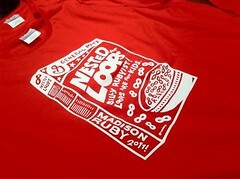 IT'S ALWAYS FUN to see a logo and t-shirt design in use. 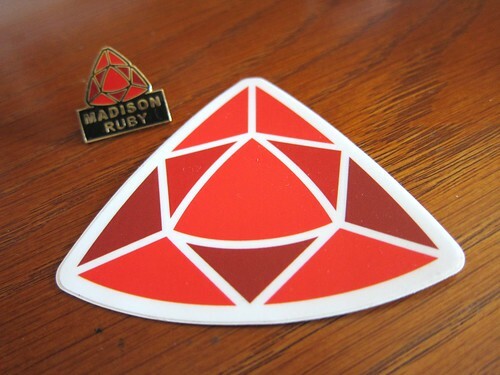 Last weekend I had the pleasure of paying a visit to Madison Ruby conference, where the logo I designed and t-shirt I illustrated were in heavy use. 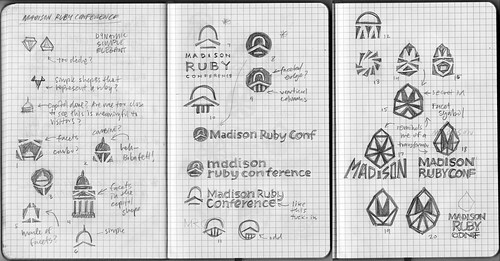 I've created a Flickr set for Madison Ruby, with all of my sketches and in-progress vector art if you're curious how a logo is created from concept sketch to final art. 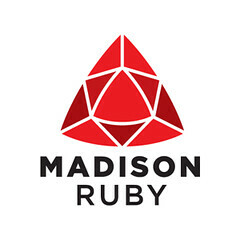 Thank you Jim and Jen Remsik for the opportunity to help brand Madison Ruby. I had a great time working with you and heard great things about the event. I've just received a box of freshly printed t-shirts I've designed for Winterblast, our church youth group's yearly winter retreat. As with the 2008 t-shirt design, I'd like to share a little more about the design process along with imagery of the final design. 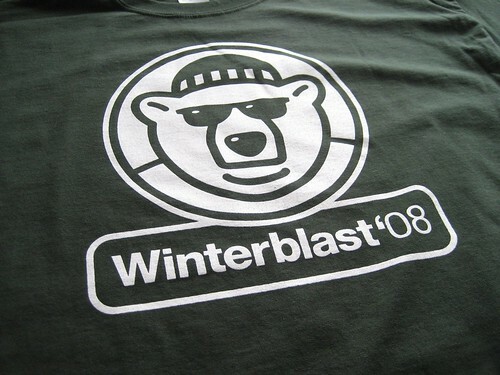 Since 2007, I've been working with a few constant specifications when designing the Winterblast t-shirt — a solid color, long sleeve shirt, white ink on the front only and a stylized wintertime animal in the artwork. For the 2007 design I created a snow monster with two broom ball sticks on a navy shirt to start this series. 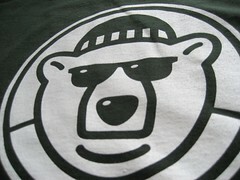 In 2008, I chose a polar bear with a winter hat and sunglasses on a forest green shirt. 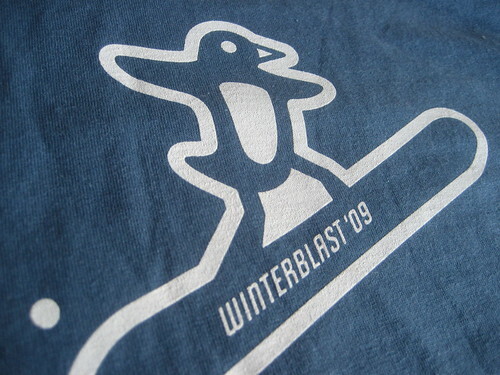 For 2009 I selected a penguin on a snowboard as the cold-weather animal to stylize for the shirt design. Tom the youth pastor wanted simplify the FOLLOW type so the double LLs wouldn't tuck together, and we both agreed that having the FOLLOW type tilting downhill (rather than uphill) with the penguin grabbing air over the type worked best. 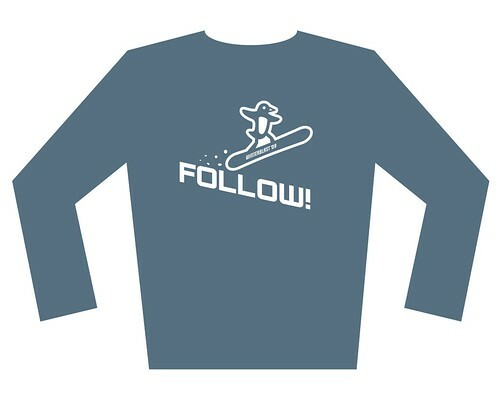 The font used for FOLLOW was based on Oxide Solid Light, with the strokes of the letters bolded manually, a customized W to match the style I wanted to see, and a custom explanation point added to round out the typographic details. Tom liked this look and shirt color, so I sent shirt sizes and final artwork to MJM Screen Print & Embroidery Studio in Menomonee Falls, Wisconsin for final printing. 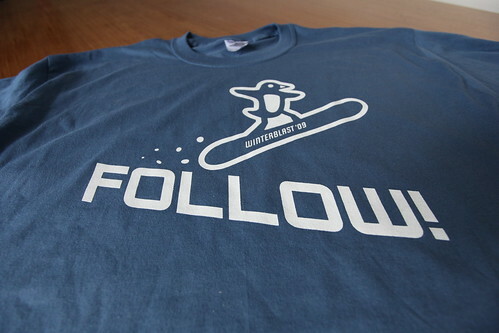 Once again, the shirts turned out well, thanks to the great work by MJM on printing. I'm looking forward to handing these out to our students at Winterblast this weekend. Recently, I was invited to try PSPrint printing, by marketing manager Trisha. For a while I've wanted to create stickers for Web414, the local Milwaukee web design and development group I'm part of, so I sent some EPS art to PSPrint. A week later, I received a package of 50 white stickers with a 2 color Web414 logo on them, and they look great! The stickers were designed at business card size: 3.5" x 2" then trimmed above and below the logo. Using my wife's corner rounder from her scrap-booking toolkit, I rounded the corners to complete the look I was aiming for. I could have gone with a custom die, but since this was a free test run, it wasn't in the budget. If I were running a large quantity, I'd most definitely order a die. PSPrint uses a medium weight vinyl for their stickers, printing the logo in 4/color fade-resistant inks with a 6 months fade-free guarantee, under normal use. The substrate is tough and resilient, though these are not intended for extreme situations. For heavy duty stickers, check out StickerRobot.com. Still, for placement on a laptop, notebook or other medium duty applications, I'm very pleased with the results of the PSPrint stickers created for Web414. 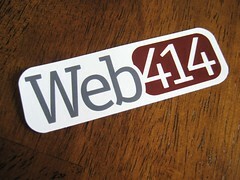 Come to the Web414 May meeting and get one free 'til they're gone! Flickr Photos: Squared, Rounded, and shown In Context with a Moleskine. For the past several years, I've had the great opportunity to design t-shirt graphics for Winterblast, our church youth group's annual winter retreat. 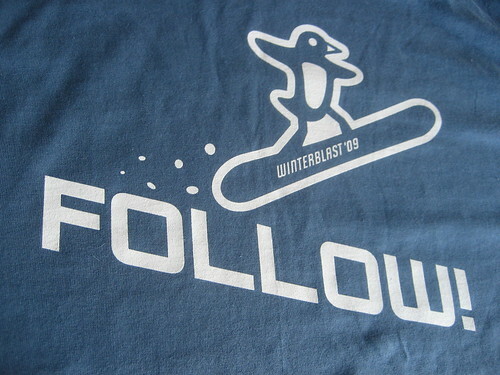 For 2007, I created a snow monster for the shirt design, and loved how the white ink on navy blue long-sleeve t-shirts turned out. 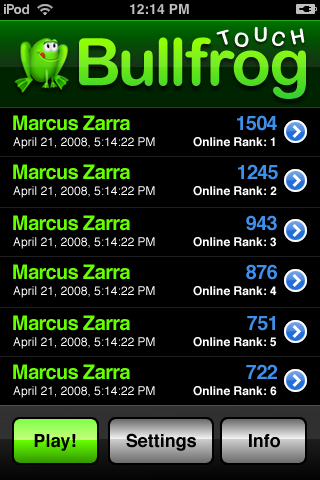 For 2008, I chose a stylized white polar bear design, on forest green long-sleeve t-shirts. To create the stylized polar bear illustration, I used image searches to locate a few reference photos, to help me establish correct proportions and shapes in my memory. Using this reference, I created a front-view polar bear in Adobe Illustrator. No sketches were necessary, as the bear idea had formed in my head by this point. After several design iterations, I decided to add a pair of black 1960s sunglasses, a winter cap, and enclosed the polar bear within a circular shape. 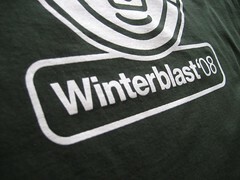 I explored various type treatments for Winterblast '08, settling on a combo of Helvetica Bold and Medium. The rounded rectangle shape around the type suggests a highway sign — as our group typically has a long road trip North to the retreat. Once the art was complete, I took my final files to MJM Screen Print & Embroidery Studio in Menomonee Falls, Wisconsin. 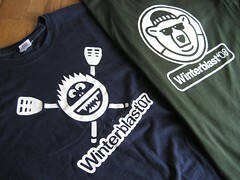 MJM provided great screen printing and superb service, turning these Winterblast t-shirts around quickly, and with great quality. I think these shirts turned out very well. I can't wait to pass these bad boys out to the 50 students and leaders going to Winterblast 2008!